New Design Books Are Here, with 2016 Updates! Whatever the size needed, these cruising multihull designs will provide the most useful, responsive cruising machines possible. Notice that instead of packing these boats with berths for dockside comfort, they are designed to be actually sailed at sea. Look at the features that will help you enjoy years of serious cruising. These are multis that are designed to be built quickly. They are all designed to maximize your vessel control and increase sailing comfort. 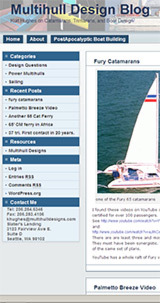 Modern cruising multis are indeed better than the old "classics" and those stuffed boatshow catamarans. If you ever get a chance to sail beside a boatshow multi on a Kurt Hughes Sailing Designs model, you will quickly see the difference. In comparison, the boatshow multi probably has fat hulls, a shorter waterline length, low underwings, masthead rig, and so on. The two boats might be about the same interior size and weight. The difference in ride will be like night and day, however. 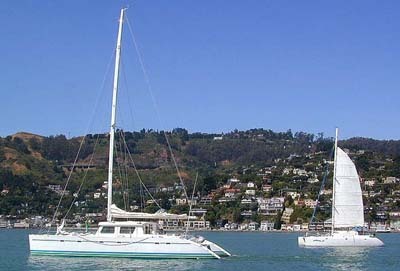 Go to windward in about 12 knots of wind and three-foot seas. The boatshow multi will be practically leaping out of the water and her crew will be hanging on very tightly. On the KHSD boat, sailing beside the showboat, you might be casually shuffling along the deck with your drinks! And there are dozens of other reasons why KHSD-designed boats are better now. One caution is that when KHSD owners sail or charter on other cruising multis, they are often disappointed. They have come to expect certain standards of performance. The KHSD cruising cats have the high bridgedeck clearance that lets you keep moving safely in bad stuff. The sail handling arrangements are ideal for short-handing. The interiors are laid out just right for cruisers. The trimarans have those big amas way out there. All have the great handling provided by the right foils, the right hulls and controls that are in just the right places. Especially on the 40' to 45' cruising catamarans, a great variety of interior arrangements are possible. With our CADD system it becomes very easy to adapt the interior to fit your individual needs. The same applies to the rigs. The indicated sail areas are examples only. The rig and sail area shown can be easily adapted to your particular conditions or any desired Bruce number. The bridgedeck catamaran cabins in this lineup are intended to be built using composite sheet materials. That is the fastest way possible for a one-off cat. These designs are also very rapid builds. Some are CM developed plywood, some are rapid-build composite hulls, and some are both. Rapid-build house cabin strategies are also available. All study plans are now available for email delivery at half the price of paper plans!